Recycling is an easy way to help the Earth. The 49th annual observance of “Earth Day”, a celebration to raise awareness of the Earth and its resources, is April 22, 2019. Read the history of Earth Day. Recycling Lessons from Recycle Guys! Visit our Earth Day board on Pinterest too! Celebrate Earth Day 2019, Central Virginia Communities Plan Earth Day Events. Stay tuned as events are added! CVWMA’s Earth Day Education Focus: Reduce your environmental impact. Rethink waste. Reduce the amount of waste you generate. Reuse as much as possible. Then, recycle items that can be recycled. Finally, close the loop by buying products with recycled content. Chesterfield Department of General Services hosting Shred & Electronics Recycling Event on Saturday, April 6, 9 am – 12 noon , VSU . Visit our Event Calendar for more information. Tire Amnesty Day, Saturday, May 4, 9 am- 1 pm. No fees. Chesterfield County Fairgrounds, 10300 Courthouse Road. Visit our Event Calendar for more information. 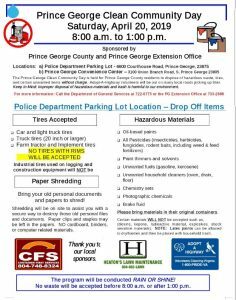 Goochland Anti-Litter and Recycling Council (GARC) hosting special recycling event on Saturday, June 8, 9 am – 1 pm. Visit our Event Calendar for more information. As part of Earth Day 2019, Hanover County Public Works is hosting an Special Collection Event, Saturday, April 20, 10 am- 2 pm, Verdi Lane Convenience Center. Visit our Event Calendar for more information. Henrico County Energy and Earth Day Event, Monday. April 22, 3- 5 pm. Eastern Henrico Rec Center. Free and open to the public. 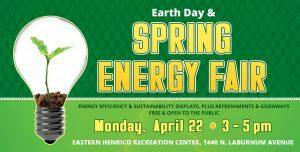 Henrico’s Energy Fair is held twice a year and is intended to bring energy and sustainability information to the residents, employees, and business owners of Henrico and the surrounding area. The fair will feature over 25 vendors that will spotlight efforts promoting sustainability, green building and energy efficiency, including the use of LED lighting, solar power, green building, recycling, and electric vehicles. Refreshments will be provided and free portable power banks will be available to the first 100 attendees. Henrico County Solid Waste Division and Henrico County Police will be hosting a special recycling collection and document shredding event on Saturday, May 4, 10 am -1 pm. Visit our Event Calendar for more information. Sat, March 30. 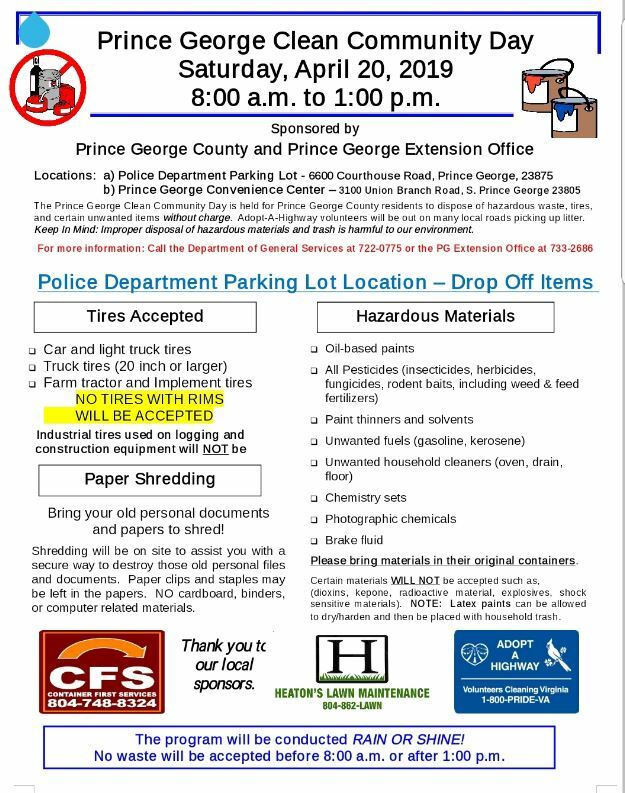 Special collection event (document shredding) at New Kent County Administration Building. Visit our Event Calendar for more information. 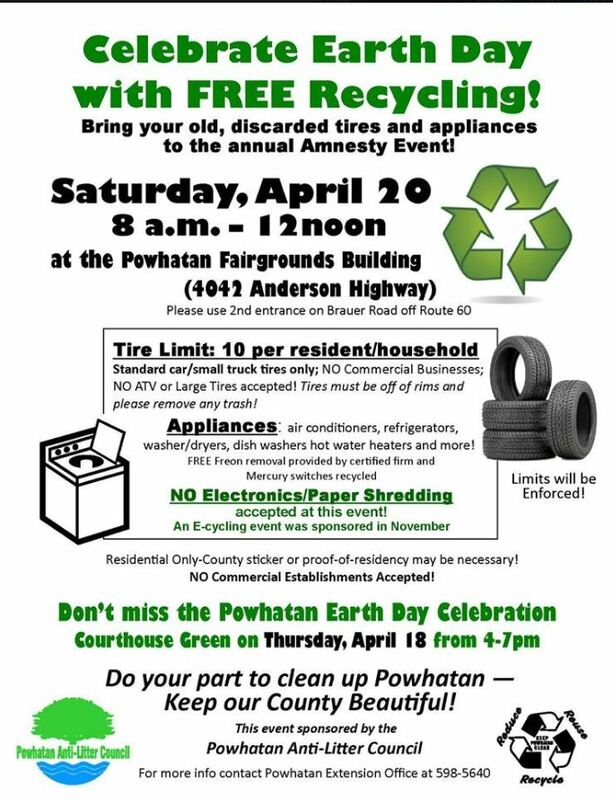 On behalf of the Powhatan Earth Day Committee, we would like to invite you to participate in the 2019 Powhatan County Earth Day Celebration. 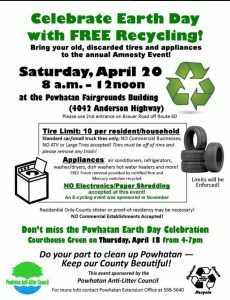 Earth Day in Powhatan County will be celebrated on – Thursday, April 18 – from 4-7 pm on the Courthouse Lawn. Celebrate Earth Day with Recycling Events, Saturday, April 20, 8 am- 12 noon at Powhatan Fairgrounds Building ( 4042 Anderson Highway). Visit our Event Calendar for complete information. As part of Earth Month, Prince George County is hosting its annual Prince George County Annual Clean Community Day on Saturday, April 20 from 8:30 am- 1:00 pm. Visit our Event Calendar for more information. City of Richmond Department of Public Works, Clean City Commission and Department of Public Utilities- Stormwater Utility hosting special recycling collection event on Saturday, May 18. Visit our Event Calendar for more information.